The old adage “walk a mile in your shoes” is how great play environments are built. Your intimate knowledge of your facility, staff, local regulations, growth needs, budget, and especially your children is invaluable to the planning phase. We start by interviewing you to understand your knowledge and vision for the children, the facility, and the outdoor environment so we'll know how to best integrate the curriculum and mission of your program. We assess the physical characteristics of your playground based on a site visit or on information supplied by you. Our goal is to provide an entire play environment, not just plan for a structure and use zone. We create a site plan drawn to scale for every Grounds For Play proposal we prepare. This plan shows locations for all equipment and any required use zones, surfacing material selections, and suggested landscape and hardscape elements. 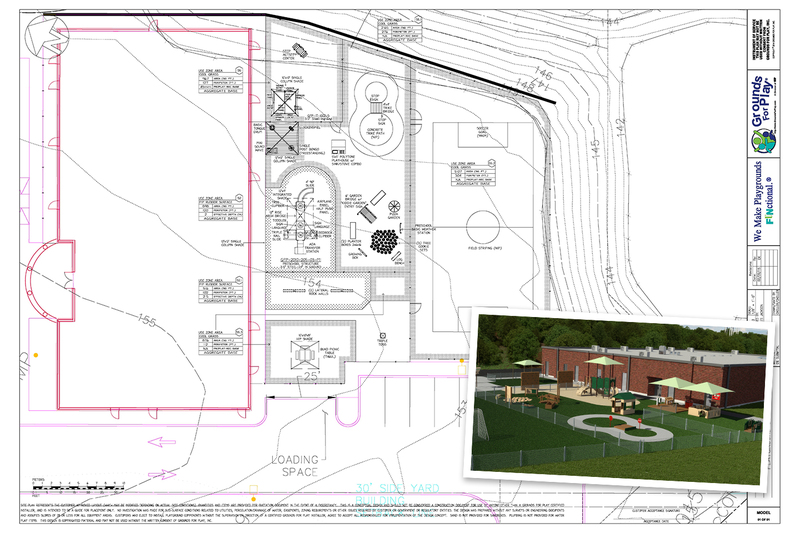 Grounds For Play plans are reviewed by a Certified Playground Safety Inspector with child development expertise for safety and compliance to federal guidelines. A detailed CAD drawing and itemized prices are provided for a complete scope of work. If we aren’t the right company for some portion of the work, we’ll let you know. When you are ready to proceed with the project, this agreement helps to clarify who does what in any Grounds For Play-installed or supervised project. Clients will be notified by this form of their responsibilities. After a purchase you will be assigned a Project Manager, who will communicate tentative schedules for shipping and installation (if by Grounds For Play). You’ll receive a packet to help you prepare for the installation. You’ll also be contacted as the installation date approaches.